Epoxy flooring is a chemically resistant, resin system, concrete flooring solution. It is tailored to warehousing, industrial, and commercial industries. Epoxy is a surface able to withstand corrosive chemicals and high impact traffic. Epoxy has many advantages over other choices of flooring. Epoxy can be used in wet areas. Delamination is minimized by the strong strength of adhesion. Minimal opportunity for bacteria growth is due to the seamless surface. Unlike vinyl or tile, wear and tear do not cause water to get below the surface where bacteria grow. There is a broad array of available finishes. Choices include aesthetic finishes, color, and non-slip rating. Laboratories, server rooms, computer assembly rooms, and other assembly points use epoxy flooring because of its anti-static properties. Epoxy applications are either self-leveling or applied as fall to drain corrections. Epoxy meets the non-slip surface requirements of areas such as walkways and ramps. Cured epoxy resists blood and many chemicals. The extremely high compressive strength is capable of withstanding heavy wheel traffic. Epoxy flooring is durable and visually pleasing. The durability makes it unlikely susceptible to damage. Its physical resistance is a contribution to a long lasting product. 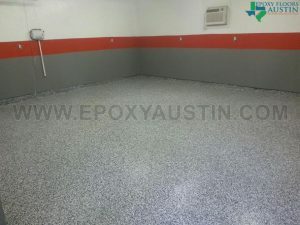 The forms of epoxy range in price from fifty cents per square foot to five dollars per square foot. The durable epoxy flooring is well worth the price. Having epoxy flooring installed improves durability against the wear and tear that occurs daily. It has superior resistance to chips, cracks, and stains in addition to the anti-static and chemical resistance already pointed out. Visitors and employees are protected when slip resistance is applied. It is recommended to have epoxy installed by professionals. Ambitious do-it-yourselfers will find the task to be relatively easy. Epoxy applies to existing concrete flooring. The amazing sheen and smoothness give the workspace an enhanced look. Creating color patterns on the floor is another great feature. Areas can be designated for guests and danger areas. Visitors can tour the facility by following paths created in special colors separate from the bright colors used to warn people to use with caution.